Cup on the Bus: Does this advance the story? At cards on Monday, Nancy wheedled from me that I do remember how to read and in the last six months read Lunch at the Piccadilly, because I saw its cover and waited weeks for it to come to the Peninsula library. The book is a tiny slice of life in your hand. Before you die, you will know this book. The slice of life will not be augmented or diminished, but you will have read a book. I have taken to spending the last hour of drowsing in the morning in recreating the books lost in the Red Bus. I started with Middlemarch, which I recall as an absolute favorite. I cannot remember a single name. But I remember the younger sister called her older sister ‘Doty’, and I have built the action and the plot rather comprehensively. I may move on to Far from the Madding Crowd, or Stone Soup. I wonder if I will ever tackle Henry James, who started this. I suppose when I remember a title, I could start. Nancy brought me her copy of the current book, A Long Way Home. The club meeting begins in forty five minutes. I want to go. The discussion lasts exactly one hour, according to my sponsor, and then everyone eats wonderful treats. But, at the end of the hour, I must drive fast to the high school to get Laura, then drive fast to downtown Akron for her appointment with her counselor, then fast back to the high school for band practice. I’ve read book clubs have multiplied since the last election began; fueled, of course, by women. The more books women read and discuss, the more dissension is fomented, apparently. I’ve been opinionated all these years without a club. The room was packed, about 25 of us for A Long Way Home. I introduced myself as someone who has lived here thirty years and is finally showing up. Then I settled back to listen. On the whole the women considered it a book of inspiration; a five year old pulling out street smarts that kept him alive until rescued to an orphanage. I look at how books are written, as well as the subject. So, I sat back and listened, on the whole. I found the story of the five year old boy well presented. But the story of the adult boy, and especially the interminable Google Earth search for his home needed a major rewrite. I suggested, to a horror struck crowd, this part of the book does not advance the story. I was countered with “Well, it took him a long time to trace all those railroad lines,” and so forth. My argument fell on deaf ears, but not deaf lips. For next month we are reading Behind her eyes. I’ll try. Remember, I didn’t make it through Lord of the Flies then, and probably could not, now. Which paragraph does not advance this story? Janie knows, I’m sure. My Uncle Hank. 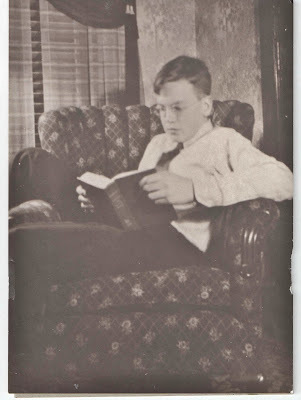 Mom took this picture about 1935. Glad you are part of the book club. Any effort at returning to reading is a good one! I remember when the kids were at home we had crazy days like yours with schedules. Always got done, but tricky at times. Well, it does drag, maybe more than a bit. OTH, this part of the search was slow. To me it shows something about persistance. But I'm just remembering from a while ago. Our book club starts next week. It is one of my favourite things! I formed a book group after the last child left primary school and had no more chats in the playground with the other mums. I left it when no one could agree which day of the week to meet and I hated some of the books chosen ! The google earth search is a long part of Saroo's story and takes up a fair bit of time in the movie also. It probably could have been written better, but I don't know how, I'm no editor and certainly not a writer. I've never belonged to a book club, I don't think I'd fit in. I wouldn't know how to discuss or describe any book I'd read apart from saying I liked or didn't like it. Be careful Joanne with all those fast driving. It must be strange to have had all those books knocked off the shelf in the red bus. My book club is disintegrating. Probably no great loss since it's usually monopolized by one woman who basically talks about everything but the book. Like you, I recall little of Middlemarch other than it was an all-time favorite. The best part of forgetting a book plot is that you get to read it again. Most of the books are forgettable. I don't have an excuse for not remembering the titles of books I read anymore. Lord Of The Flies was horrid and that's what I think about many of the Russian writers. I like books that I can't wait to get back to and have trouble finding them. Glad you joined that group. You'll get through to them eventually lol. Hank looks well and truly lost in his book. No book club here either. I don't want to discuss the books I read, except with my husband sometimes. And I want to read whatever I feel like reading! Analyzing a book does nothing for my enjoyment of it, and enjoyment is my reason for reading. Ditto, except my husband the first didn't "get" reading, why read? when a TV was right there. Hah! Give me a good book any day. I was telling my son just the other day that I wished there was a book club close enough for me to join. I miss being able to have meaningful discussions with others. I participate in an online book club. That way I can say my piece and no one looks at me funny! As far as I'm concerned, every paragraph advances the story because you're writing your life. A Long Way Home was made into the movie Lion, which I think you'd like. The Google Earth stuff is not interminable in the movie.